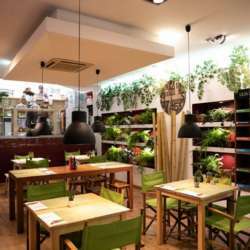 Situated in downtown Cascais, Greenwish is above all a healthy space! In addition to the salads and sandwiches, there is a vegetarian daily dish; as well as vegan, gluten-free and refined sugar options. Their pancakes, both savory and sweet, and tarts already have become a phenomenon! Greenwish is not only green in name, decoration and food, most importantly – their philosophy is green! Therefore, they do not distribute any plastic, opting for paper straws, boxes, bags and cups, and the take-away cutlery is made of bamboo. Come and discover their yummy juices and snacks while meeting and mingling with other expats and “Global Minds” from this area or visiting. Registration will close 10am the morning of the event to provide the venue with correct numbers. Pls. only RSVP if you are sure you want to join!  Anyone not signed up and still want to join after can still come, however, as per InterNations policy, the “Not signed up” fee applies (incl. Albatross and Consul). Welcome to the greenest café of Cascais!